The ban has been blocked by lower courts which have said that it is discriminatory. Two emergency applications have now been filed by the government with the court's nine justices that seek to overturn those lower court rulings. The controversial ban has prompted protests and debate across the US. "We have asked the Supreme Court to hear this important case and are confident that President Trump's executive order is well within his lawful authority to keep the nation safe and protect our communities from terrorism," said Justice Department spokeswoman Sarah Isgur Flores. "The president is not required to admit people from countries that sponsor or shelter terrorism, until he determines that they can be properly vetted and do not pose a security risk to the United States." The administration has asked the court to grant emergency requests that would see the travel ban reinstated immediately. That ruling could come within two weeks. The court will then decide whether to hear the administration's full appeal. If it does, that could take place in October. Opponents of the travel ban vowed to continue their fight. The American Civil Liberties Union, tweeted: "We've beat this hateful ban and are ready to do it again." 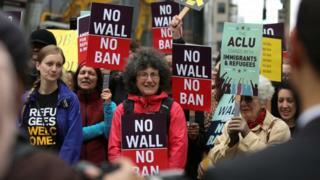 Karen Tumlin, legal director of the National Immigration Law Center, told Associated Press: "Again and again, our nation's courts have found that President Trump's Muslim ban is unconstitutional. We will continue to defend our plaintiffs' right to live free from fear of discriminatory treatment by the federal government." Mr Trump signed his original executive order shortly after coming into office in January. It banned entry to nationals from Somalia, Iran, Iraq, Syria, Sudan, Libya and Yemen for 90 days and halted the refugee programme for 120 days. Its implementation caused chaos at airports and protests in a number of cities. It was blocked after a legal challenge initially mounted by Washington state and Minnesota. Mr Trump then signed a revised order in March to try to address legal issues, and removed Iraq from the list. However, a district court in Maryland found the ban violated constitutional rights and blocked it before it could take effect on 16 March. A federal judge in Hawaii also sided with opponents, finding that the ban was discriminatory and citing "questionable evidence" in the government's argument that it was a matter of national security. Last month, a federal appeals court in Virginia dealt Mr Trump a fresh blow when it refused to lift the temporary block. It said that the government's national security argument was a "secondary justification for an executive order rooted in religious animus and intended to bar Muslims from this country". Mr Trump will need the support of five of the nine Supreme Court judges to reinstate the ban. The president's appointment of Neil Gorsuch this year reinstated a 5-4 conservative majority. However, the conservative Justice Anthony Kennedy could be the swing vote, as he sometimes sides with the liberals. They will need to decide whether Mr Trump's order was intended to discriminate against Muslims.